While we celebrate 90 years of reunions, the State of Oregon is celebrating its sesquicentennial. Founded in 1859, sixteen years after our ancestors arrived in the first wagon train to bring their wagons all the way to Oregon, it was the 33rd state in the Union. 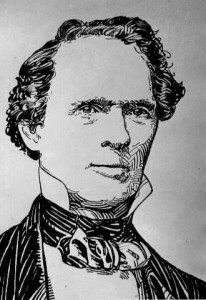 The Hewitts, Mathenys, and Coopers com-prised approximately five percent of the roughly 900 settlers in the Great Migration wagon train, a key factor in Oregon history. Our reunion site chairperson has been busy! 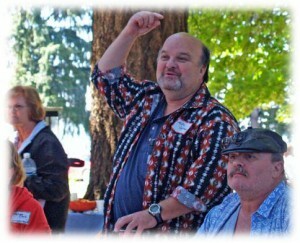 Mike and Jim Layman making a point at the 2008 reunion. “I have reserved Maud Williamson State Park, as usual, back to the covered eating area in the middle of the park. So we will be back to normal as far as that goes. I even have another reunion “Walling Reunion” that I am helping get started this year. It is also to take place in the covered area of Maude Williamson State Park on July 12th, 2009 at 1:00 pm. “My mother called me today to tell me about the great article about the Hopewell church. They are celebrating their 150th anniversary. Many of my relatives are buried there—-both my mother’s parents. She plans to have her own plot there, if she doesn’t already. My parents were married there.” from an email from Christine Cranmore. As listed in Lorna Grauer’s book, The People of Hopewell Cemetery, we have many ancestors buried in Hopewell. The land was donated by Rachel Matheny. Any of our family can have a plot there, but it’s no longer free. The cost is about $250. The rule is that anyone that lives within fifteen miles of the cemetery or has a relative buried there can purchase a plot. It is managed by a cemetery association, which meets annually. For several years, some of our family members met at the cemetery in the spring before Memorial Day to do a cleanup. This event has been discontinued since the maintenance personnel have been keeping it maintained. It had been suggested that the family make a place for relatives to sit and visit, as many do on Memorial Day, perhaps with a couple of benches. A monument with a brief history of the cemetery could make it more of a destination for family exploring their heritage. Elma Hewitt has suggested having a small columbarium (building with recesses for cremation urns) at the cemetery. It wasn’t approved in the past, but anyone interested should contact Elma.